OJ Simpson is about to get out of prison. Paroled. And he looks good for 70. White leftists are losing their mind over the idea of a free OJ. If you think Barack Obama polarized America, you have forgotten about the OJ trial. I will never forget the day when the verdict was read. I watched TV and saw a scene where blacks and whites watched side by side. White folks were on the left side of my TV screen, and blacks on the right. When the verdict was read, it was crazy to see the right side of the screen erupt with jubilation, while the left side of the screen looked like Hillary Clinton supporters on election night. The country was truly split down the middle based on color. Black people saw the OJ verdict as vindication of years of black oppression by a racist criminal justice system. Most blacks in America believed OJ, a black man, had beaten the crooked system. Eventually, “the man” caught up with OJ, and he ended up in prison. This time for armed robbery. Black people were nonchalant over that arrest. There was video of what OJ did. As far as black people were concerned, armed robbery doesn’t deserve the attention OJ got years earlier. In the vernacular, “OJ just caught a case.” That happens to many black men, thus OJ was on his own. White people, mostly white leftists felt vindicated. Even though OJ was sentenced for only armed robbery, OJ was off the streets. White conservatives for the most part were too busy to care about OJ. Hey, he hadn’t killed their daughters. Moreover, conservative women avoid the OJs of the world; the athletes, entertainers and such. The life is glamorous on the outside, but hell on the inside. Don’t believe me, ask Nicole…nevermind. Now that OJ has been paroled, white leftists feel like a wound ripped open. They thought, hoped OJ would die in prison. But now he’s getting out. White leftists, the real racists in America can’t handle the fact that OJ will again see freedom. The ugly truth is murderers are freed every day in this country. Leftists are the reason we have more criminals outside of prisons than inside. So what a black man now makes room for another. Get over it. Look I don’t really know or care if OJ killed Nicole. But I do know there are much bigger things to get upset about. OJ served 9 years in jail for trying to recover memorabilia. Most perps would have been home by dinner, if that was the charge. It’s likely that OJ would have served less time had he admitted to killing Nicole. Truth be told, if he had killed a black chick, we aren’t even having this conversation. Anybody remember that black pro football player who killed his girlfriend because she wouldn’t have an abortion? Yeah, me either, but a true story. I Googled him out of curiosity, “pro athletes who murder their girlfriends”. His name is Rae Carruth. Remember now? But the real irony may be that OJ finds freedom during the Era of Trump. How cool is that. While Obama was freeing black drug dealers, he could have scored points by freeing OJ. I only wish Trump had PARDONED OJ. Consider how white leftists would react. Can you imagine the tweets? Leftists would be livid. They couldn’t call Trump a racist for getting OJ out. Black people would consider it a great move. That one move might have done more for the black vote than Trump’s funding of Historically Black Colleges and Universities. As for OJ, pardon or not, he’s officially free. Now 70, Simpson’s energy seemed little affected by his time behind bars. He was alert, engaged, and quick to smile, even letting out a hearty laugh when parole board Chairman Connie Bisbee accidentally said he was aged 90. “I feel like it,” he said. 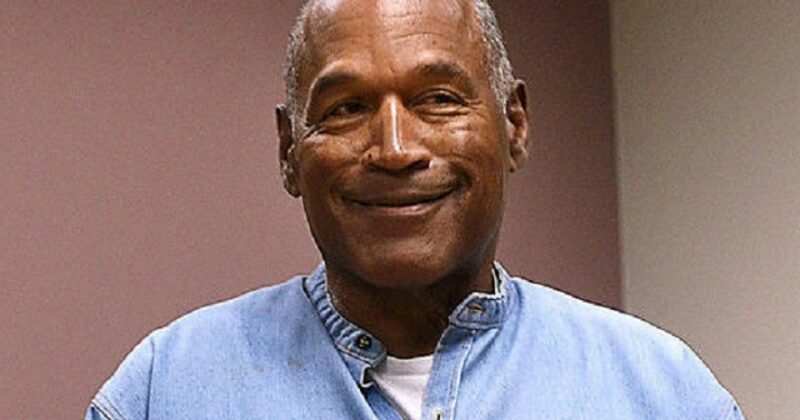 I’m glad OJ is free. 9 years for theft is ridiculous. And whether people like it or not, he was not convicted of murdering Nicole Brown. Let’s see if Trump tweets about it. You can bet that Obama would have invited him to the White House for Beerfest.